A few months ago I decided to work through every cut of every animal that is bred and killed to adorn our plates for the blog. Hopefully I’ll succeed in this – both having been a vegetarian in my past and hating any kind of food waste have greatly contributed to this bee I have in my bonnet. There are so many different cuts of meat – as in muscle – and offal – as in odd bits – that we should revel in the astounding variety we have, but instead we generally do not; chickens are killed for their breasts, cows are killed for their rumps and fillets, and pigs and sheep for their legs and loins. I wouldn’t feel guilty if I bought a pack of chickens’ livers that came from intensively-reared chickens, but I could never buy chicken breasts from those chickens. There is perhaps an argument that vegetarians and vegans could eat such offcuts, since no chicken has died for its giblets or calf for its sweetbreads. Things are getting better – people are becoming thrifty and with all this Horsemeat Scandal of the past few months, they have become much more interested in meat. Cheaper cuts are being tried, and everyone is realising that the whole animal is delicious. My local butcher has trays of hearts, sweetbreads, pigs’ tails and allsorts, which I am sure were not so easily available a just couple of years ago. I wonder if we’ll ever get back to the stage where there are trays of calves’ and lambs’ brains in the butcher’s shop window. I doubt that, but hopefully it will be possible to order them at least. I haven’t tried all of the cuts myself – tripe and chitterlings leave a gap in my own meat cookery knowledge. So I think things are looking good – the more offcuts and offal we eat, the fewer animals are reared to feed us. This in turn makes meat cheaper, and animal husbandry kinder and less intensive which can’t be bad. 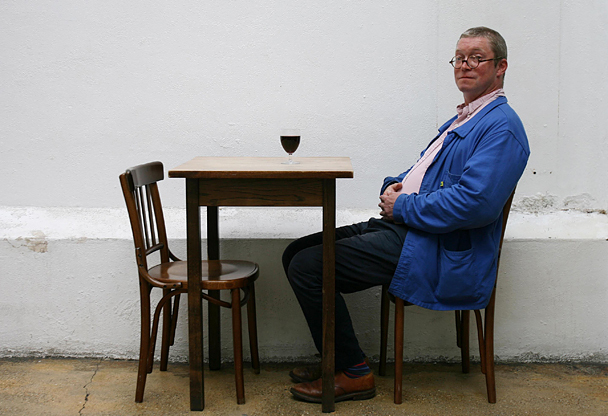 I have to mention Mr Fergus Henderson here of course – he is the owner of St. John restaurant in London who coined the term Nose to Tail Eating and really brought the eating of offal right into the foreground of Britain’s food culture today. Of course many recoiled in horror, but then it turned out that all this food was delicious. All’s well that ends well. I had the idea of using all the cuts when I made oxtail soup a few months ago, and so I dubbed the series ‘Tail to Nose Eating’. I am sure Mr Henderson won’t mind. The other person to name here is Hugh Fearnely-Whittingstall whose experiment in self-sufficiency has created the behemoth that is River Cottage. 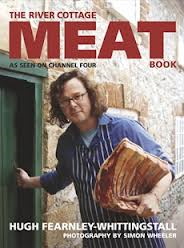 His astoundingly comprehensive River Cottage Meat Book is simply excellent (as are the other ‘handbooks’ he and his team have produced) and it cannot be bettered. His television programmes are great too as they show the process of growing, eating and killing animals when done on a small scale and how this compares to the farms that supply to our supermarkets. HFW also shows us all how to cook offal and other underused cuts and we get to see people eating the food and not throwing up, but licking their lips and having second portions. Slice a pompion, and boil it in fair water, till the water grows clammy, or somewhat thick; then strain it through a fine cloth, or sieve, and with this make your Bread, well kneading the dough; and it will not only increase the quantity of it, but make it keep moist and sweet a month longer than Bread made with fair water only. It funny that the British have always had a thing for bread that stays ‘fresh’ for as long as possible; the French, for example, expect the opposite and buy there’s once or twice daily . It goes back to the days when the old brick bread ovens were lit but once a week so the bread – and other goodies – had to last. This love for bread with a long shelf-life is also often blamed for our love of the moist mass-produced packaged breads that go mouldy before they go stale, but I digress. 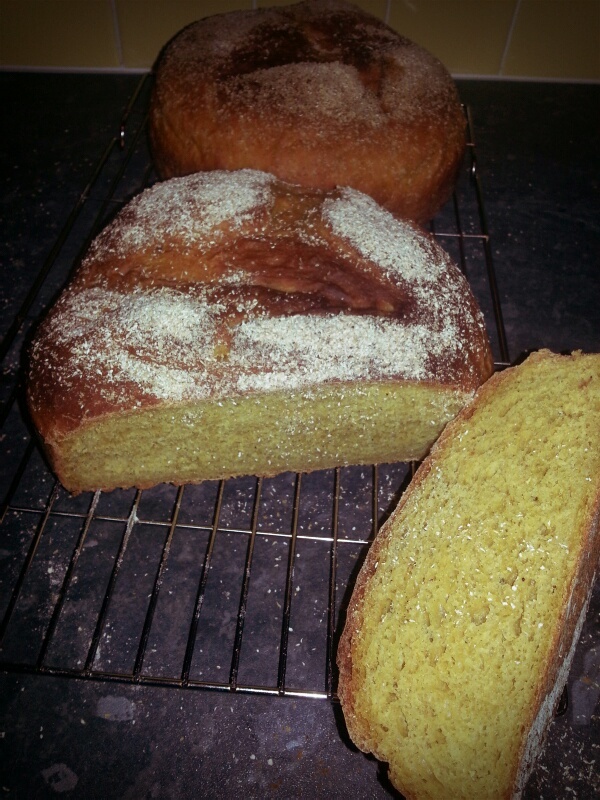 I thought I would give this pompion bread a go, but I felt that boiling the poor thing to death was a bit wasteful, and I wanted the bread to have some pumpkin flavour so I roasted it, mashed it up and added it to a basic bread dough along with a little sugar and some mixed spice. It turned out to be delicious so I thought I’d give you the recipe to try. I don’t think it resembles the original recipe, but it certainly inspired me to make it. By the way, it doesn’t stay fresh for a month, but it is very much moist and edible five days later. It goes great with soup and stews or with jam or just butter spread on it. This recipe makes 2 good-sized loaves. 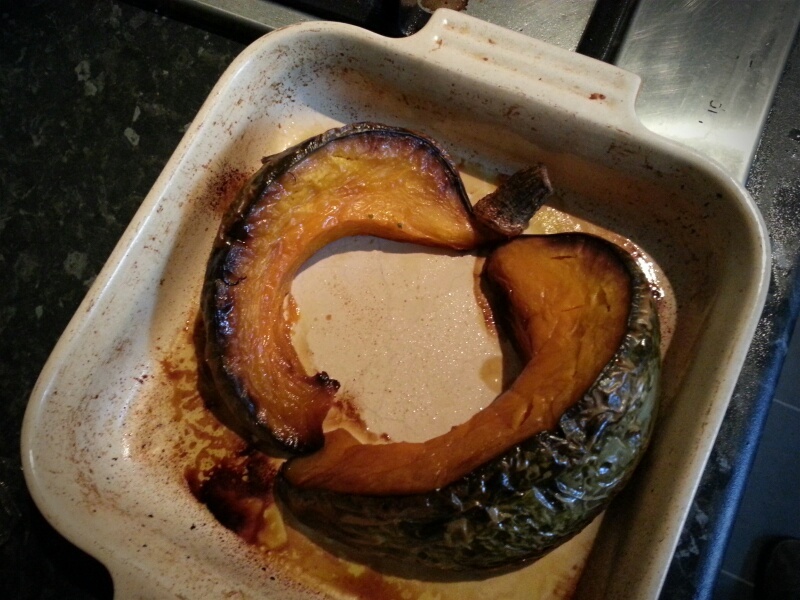 Begin by roasting the pumpkin in a little olive oil until soft – around 30 minutes at 180⁰C (350⁰F). When cooked, remove from the oven, cool, remove skin and mash to a pulp. Mix the flour, oatmeal, mixed spice and sugar in a bowl, then crumble the fresh yeast on one side of the bowl, and spoon the salt one the opposite side. Make a well in the centre and pour in the water along with the olive oil. Notice that I have given the weights of liquids here – I’ve taken to doing this with all my baking recently; you can be much more accurate that way. (For most water-based liquids one millilitre weighs one gram. You can thank Elizabeth David for that one.) Lastly, add the cool pumpkin. 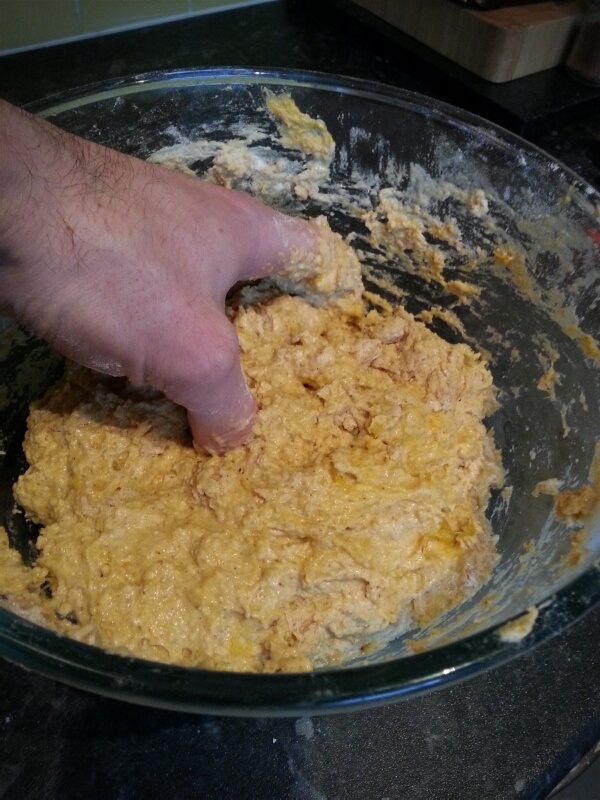 Using you hand, mix everything to a sticky dough – it will be very sticky but don’t worry. Rub a teaspoon or two of olive oil on your work surface and turn out your dough onto it; the oil makes it easier to knead without it all becoming a hideous sticky mess. Keep kneading and adding more oil if need be. If all this seems like too much effort and mess, use the dough hook on a food mixer instead. When the dough is smooth, do a final kneading on a little flour, then pop into a clean bowl that has been lightly coated with oil to prevent sticking. Cover with Clingfilm (other plastic wraps are available) and allow to ferment away until it has at least doubled in size. Knock back the dough and shape into two loaves – you can do round cobs on a greased baking sheet or in greased tins, whichever you prefer. 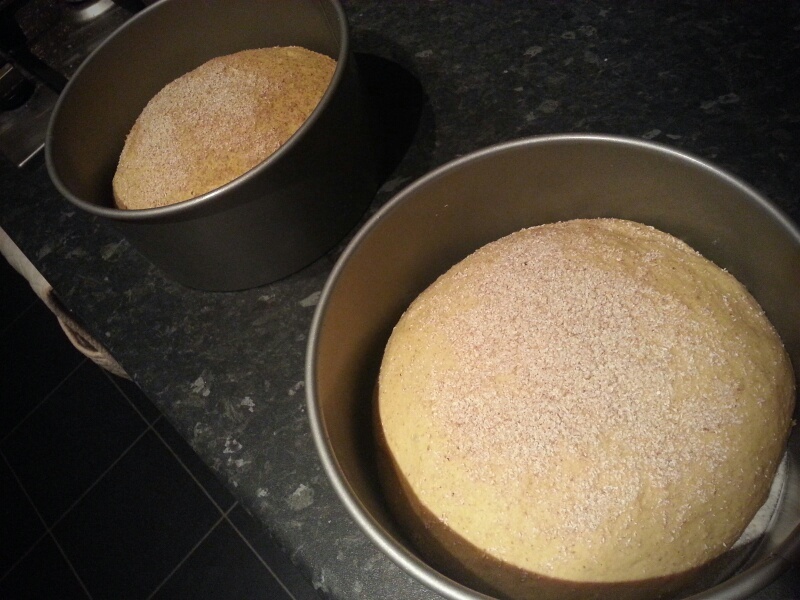 i used two cake tins so that my cobs would keep some shape. Cover and allow to prove. Make appropriate cuts and dustings of flour or oatmeal. When doubled in size put into a cold oven. Set the temperature to 220⁰C (425⁰F) and leave for 15 minutes. Turn the heat down to 180⁰C (350⁰F) and bake for a further 15 minutes. Allow to cool on a rack completely before breaking into it.